The National Social Anxiety Center (NSAC) leads monthly, online peer consultation meetings in partnership with the Anxiety and Depression Association of America (ADAA). These peer consultation meetings are open to all licensed psychotherapists who are seeking to improve their work with socially anxious clients. These meetings are used to discuss social anxiety-related cases we have in our practices, as well as evidence-based cognitive-behavioral strategies and how to apply them. You are welcome to discuss a case of your own (without using any client identifying information), bring up a topic about evidence-based strategies for social anxiety to discuss, participate in the discussion of other cases and topics, or simply listen and learn. The meetings are free and are open to any licensed mental health professionals. In order to see the video of those participating in these meeting and to be seen by others, you would need to have a good internet connection on your computer, tablet or smart phone with a video camera in your device. Alternatively, you can call in the meetings on any phone and be able to hear everyone and be heard, but without the video. These peer consultation meetings are a joint project of the National Social Anxiety Center (NSAC) and the the Anxiety and Depression Association of America (ADAA). This peer consultation forum is one of the activities of ADAA’s Social Anxiety Special Interest Group, which NSAC founded and leads. If you are interested in receiving monthly email notifications about these peer consultation meetings, including the link and other information about how to connect, please complete the following form. 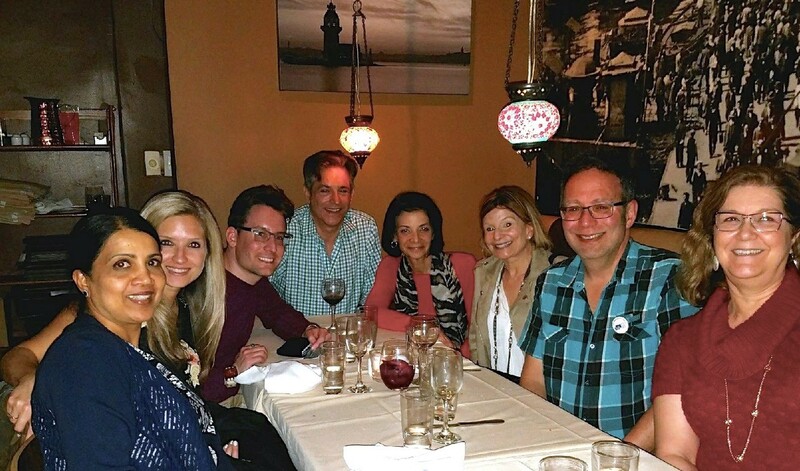 Some of the Board representatives of the National Social Anxiety Center’s regional clinics joining for dinner during the Anxiety and Depression Association of America conference in Washington, DC, April, 2018. Left to right: Suma Chand, PhD (NSAC St. Louis); Lauren Neaman, PsyD (NSAC Chicago); Noah Clyman, LCSW-R (NSAC New York City); John Montopoli, LMFT, LPCC (NSAC San Francisco); Randy Weiss, LCSW (NSAC Phoenix); Holly Scott, LPC (NSAC Dallas); Larry Cohen, LICSW (NSAC District of Columbia); Celeste Conlon, PhD (NSAC Houston / Sugar Land).